Summary of today’s show: Chris Carmody joins Scot and Fr. Chris to discuss the 2nd Vatican Council’s Dogmatic Constitution on the Church, Lumen Gentium, and its groundbreaking look inward that helped the Church address the modern world in new ways and opened up a new understanding of the laity’s role in the Church. 1st segment: Scot welcomed Fr. 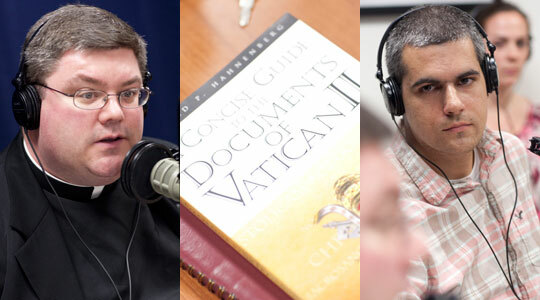 Chris back to the show and said they’ve been planning to discuss the various documents of the Second Vatican Council and today they will be discussing Lumen Gentium, the dogmatic constitution on the Church in the World. Fr. Chris said this is the constitution for the Church and Pope John Paul and OPope Benedict have always referred to this document on a regular basis. Unlike all the other councils in the Church, this was the first that wasn’t called to address a heresy or combat a schism. It was called to take a look at where the Church has been and where it is heading. Pope John XXIII said, “Let’s open the windows and let in the fresh air.” There was no other agenda. Scot said there were 21 councils in the history of the Church and the previous one was Vatican I in the 1870s. Fr. Chris said the Vatican Council was a continuity and a renewal. It was designed to capture who we are and what we are about. He also noted that Pope John Paul and Pope Benedict were young scholars at the Second Vatican Council and had key roles in shaping the council. Fr. Chris said the Church has occasionally called all the bishops of the world together in ecumenical council. He said some scholars said this may have been the first truly ecumenical council with bishops from all over the world contributing for the first time. More than 2,600 bishops were at the council, as well as other experts and observers from other Christian denominations. Scot noted that most of the meetings took place inside St. Peter’s Square with all the thousands of attendees during all these meetings. 2nd segment: Scot welcomed Chris back to the show. Before Easter, he was on the show to talk about the Hunger for Justice pilgrimage for youth on Good Friday and Holy Saturday. He’s been studying in the Masters of Arts in Ministry and will be transferring to the Masters of Arts in Theological Studies at the Theological Institute for the New Evangelization. He has always loved studying theology from his days as an undergrad at Franciscan University of Steubenville. He found the course on Vatican II to be valuable because he’d never had a chance to read through the documents themselves. Scot asked about the context of Vatican II. Fr. Chris said Pope John XXIII was originally seen as a bridge between popes and a quiet keeper of the Vatican. But he said he felt moved by the Holy Spirit to call this council. He sent out to all of the bishops of the world a blank slate and asked what they should be talking about. From that came all of these documents which began discussions at the Vatican lasting many years addressing important issues. Scot said 16 documents were the product of Vatican II. It opened in 1962 and closed in 1965 with four separate sessions. Four documents were constitutions: divine revelation, on the Church, on the Church in the modern world, and on the sacred liturgy. There were 9 decrees and three declarations on various topics. Fr. Chris said the constitution is the backbone that sets the scope for how we’re going to proceed. The declaration makes a statement on a topic, what it is and why it’s important. Lumen Gentium (Light of the World), on the Church, was the Church looking inward. Gaudium et Spes (Joy and Hope), the Church in the World, looks at the Church’s interaction with the world. The former is dogmatic, t he latter is pastoral. Chris said before we can talk to anyone else, we need to look at who we are and that’s why the Church looked internally before addressing our interaction externally. Fr. Chris said Lumen Gentium is the key document of Vatican II because it defines the Church. The other documents are in some way leading back to the Church, and so their root is in Lumen Gentium. Lumen Gentium is broken up into eight sections: the mystery of the Church, the People of God, on the hierarchical structure of the Church and in particular on the Episcopate, the Laity, the universal call to holiness, religious, the nature of the pilgrim church, and the Blessed Mother. 3rd segment: Scot said Cardinal Cushing represented the Archdiocese of Boston at Vatican II. Fr. Chris said he was instrumental in the piece on ecumenism and interreligious dialogue. Scot said one of the key themes is that of unity. Chris said it comes from the creed that we are one, holy, catholic, and apostolic. Within our unity, we show the unity of Christ to the world: bishops in union together and with the pope and the people in unity with their bishop. Fr. Chris said we are made in the image of God and Pope Benedict emphasizes that a key term of Vatican II is communion. God is three persons in one nature and we need to image that unity among each other. Scot recalls the image of Christianity as a team sport. We’re not called to be individuals in the Church nor is the Church to be isolated from the world. We’re called to be in relation, but we should be a sign of unity with each other in the kingdom of God on earth. Fr. Chris said the Mass is where we find God’s Word, God’s sacrament among us, and God’s marching orders to us. Scot said Lumen Gentium tried to answer what is the Catholic Church in relation to the church that Jesus founded: Is it entirely the Church he founded? Chris said they concluded that we are the Church that Christ founded, but we’re still working toward that goal in our unity. The document says the true Church of Christ subsists in the Catholic Church. Fr. Chris said because Christ has promised to never abandon the Church, we believe that the fullness of the Church as founded by Christ, resides in the Catholic Church, and that’s where we will find holiness. Before Vatican II, some said there was no way to be saved without being a baptized and active Catholic. Fr. Chris said there are possibilities for people outside of the Church to be saved, but if you know the Church to be the fullness of salvation, then you have an obligation to give yourself to the Church and be part of the Church. Scot said the document tried to broaden the description of the Church beyond the visible and institutional. Vatican II said it also invisible. Chris said the Church is also the People of God and the Mystical Body of Christ. When we are out in the world, we are the Church, even when we are not inside the building. There is no one description that encompasses the fullness of the Church. Fr. Chris said when you look through a diamond, you see it through different prisms or angles. How do you describe a mountain to someone who’s never seen one? The idea of the People of God shows that the Church is a pilgrim Church on the way to salvation. All of the members of the Church are sanctified and made holy. Scot said the document seems to endorse that there are many descriptions of the Church; that people can approach the Church with different ideas. Chris said Lumen Gentium talks about the Church as being pilgrim. The Church on earth is in communion with the Church in heaven. We are always with each other; we are not alone on the journey to heaven. 4th segment: One of the goals of the document was to define the roles within the Church. One of those definitions looked at the relationship between the Pope and the bishops and the tension of the pope’s authority versus the bishop’s collegiality. Fr. Chris said the document reminds us that we’re a hierarchical church. It starts with the the great reverence and respect for the Pope. He stands in the person of Christ in a primary way. He shares the teaching authority of the Church with the bishops. Vatican II recognized that each bishop has the fullness of the priesthood. A priest preaches because he shares in his bishop’s ministry. Vatican II affirmed very carefully that if you’re looking for the Church, look to the unity in the local diocese between bishop, priests, and laity. The parish is just a microcosm of the diocese. The bishops share a collegiality with the Pope. They are not the Pope’s lieutenants. They have a primacy in their dioceses as the unifier and governor and teacher. Scot said the permanent diaconate was re-established after Vatican II and articulated in Lumen Gentium. Chris said he was surprised when he learned that there was a long period in Church history when the permanent diaconate was not part of the Church. The deacons are a great resource for the Church. Scot said Vatican II envisioned that it would be mission countries with priest shortages that would embrace this ministry, but it was Western nations that now have the most deacons. Their roles in the Church were outlined including preaching and administering certain sacraments. It is the duty of the deacon, according as it shall have been assigned to him by competent authority, to administer baptism solemnly, to be custodian and dispenser of the Eucharist, to assist at and bless marriages in the name of the Church, to bring Viaticum to the dying, to read the Sacred Scripture to the faithful, to instruct and exhort the people, to preside over the worship and prayer of the faithful, to administer sacramentals, to officiate at funeral and burial services. Chris said one of his favorite parts is when the Church addresses the youth. The Church is ever-young despite being one of the oldest institutions in the world. By the power of the Gospel He makes the Church keep the freshness of youth. Fr. Chris said the Church is often defined by oppositions: old and young, holy and sinful, priests and laity. No one term ever describes the Church, but must always encompass “both/and”. Too many of us get into the mindset that the building is the church, but the Church is the People of God, from the Pope to the newest baptized person. Not just the laity or just the clergy, but all of us. Chris said Lumen Gentium says the “laity is here understood to mean all the faithful except those in holy orders and those in the state of religious life specially approved by the Church.” They are those who live out the Christian life in the world. [B]y their very vocation, seek the kingdom of God by engaging in temporal affairs and by ordering them according to the plan of God. They live in the world, that is, in each and in all of the secular professions and occupations. They live in the ordinary circumstances of family and social life, from which the very web of their existence is woven. They are called there by God that by exercising their proper function and led by the spirit of the Gospel they may work for the sanctification of the world from within as a leaven. In this way they may make Christ known to others, especially by the testimony of a life resplendent in faith, hope and charity. Therefore, since they are tightly bound up in all types of temporal affairs it is their special task to order and to throw light upon these affairs in such a way that they may come into being and then continually increase according to Christ to the praise of the Creator and the Redeemer. It is through baptism that all Christians share in the priesthood of Christ, in his role of prophet, and in his kingship. Scot said this priesthood means anyone who sacrifices on behalf of God. We are all called to preach, to teach, and to sanctify, in a certain way. The laity teach by witnessing in the world, they are sanctified by their prayers for one another. It’s not just religious and clergy who are called to holiness, but all are. Scot said this section of Lumen Gentium was innovative and is what St. Josemaria Escriva preached. Chris said we are called to be “perfect as your Father is perfect.” He finds it the hardest teaching. People believe that perfection is impossible. In order that the faithful may reach this perfection, they must use their strength accordingly as they have received it, as a gift from Christ. They must follow in His footsteps and conform themselves to His image seeking the will of the Father in all things. They must devote themselves with all their being to the glory of God and the service of their neighbor. Fr. Chris said the Church is not a museum for saints, but a hospital for sinners. We’re all on the road to holiness. But it is right that we’re called to holiness because it is friendship with God and ultimate friendship with God is heaven where we gaze on the face of the Father. We say the Church is holy because Christ promised that he would never abandon the Church to make sure that what the Church teaches is true. If what the Church teaches isn’t true, then Christ would be a liar. Fr. Chris emphasized the role of the Holy Spirit in the Church, animating the Church and convicting us in both our faith and in our sinfulness. The council fathers emphasized the Holy Spirit in each of our lives. 5th segment: In this segment, we’ll talk about the Blessed Mother. There was some discussion at the council about whether there should be a separate document on the Blessed Mother. Fr. Chris said we have to emphasize the role of Mary’s life in each Catholic’s life, but we can’t overemphasize her above the Father, Son, and Holy Spirit. And since there was n’t a document on the Persons of the Trinity, they didn’t think there should be a separate one for her. Chris said the document says Mary is the perfection and model of the Church. She is what we are working toward and she is a sure source of our hope. Scot said the role of Mary was key in the discussions in ecumenism. Fr. Chris said the Church tells us we cannot compromise the truth to please someone else and Mary is an essential element of our faith. Mary is at the two moments of the institution of the Church: At the foot of the cross where the blood and water from Christ’s side and Jesus gives Mary to John, representing us; and at Pentecost when the Holy Spirit descends on the apostles. Scot said the document clarifies that Mary is our intercessor who goes to her Son to mediate our prayers. Chris said when we honor Mary, she is making known the Son to us. Her mediation doesn’t remove Christ’s mediation on our behalf. Fr. Chris said she is a powerful intercessor. The mother goes to her Son and begs for us. We can count on our supernatural mother being with us and to guide us through life. Next year will be the 50th anniversary of the opening of Vatican II and we will continue to revisit the documents of Vatican II between now and then.